SAME COOKING TIME AND TEMPERATURE APPLIES WHEN USING A CONVENTIONAL OVEN. Add the Lobster Base, cayenne pepper, lemon juice, and garlic to a small bowl. Whisk to combine. Divide the marinade in half. Pour half of the marinade into a medium sized bowl, add the shrimp and toss to combine. Cover the bowl and refrigerate for 30 minutes. Preheat the Big Green Egg® to 400°F. Set EGG® for direct cooking with the porcelain grid. Remove the shrimp from the refrigerator and skewer the shrimp, 2 per skewer. Add the skewers directly to the EGG and grill for 2-3 minutes per side. 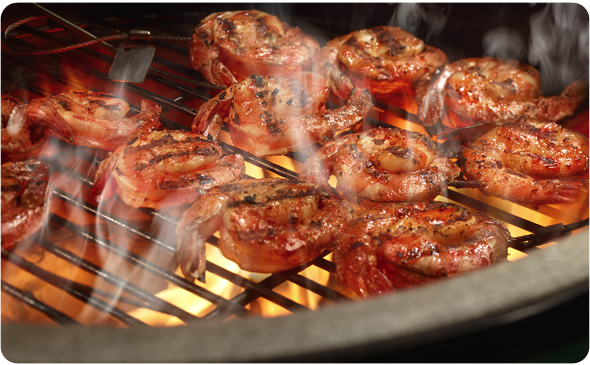 Carefully remove the skewers from the grill and serve immediately with the remaining reserved marinade.